I'm so into leo right now! I love it! The color is amazing and I'm obsessed with leopard print too - it's perfect! I love scarves.....never really did before.....but Im loving them lately,..I bought a few and cant wait for it to get a tad cooler to break them out!! could i possibley ask a small favour? 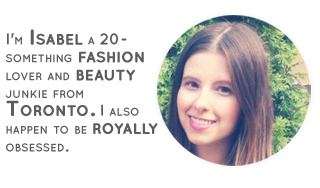 that you vote for me here http://apps.facebook.com/voteformyblog/vote.php?id=1049 ? I'd love you forever! Oh, I love ANYTHING Madewell! Gorgeous. oooo HUGE fan of that scarf! I hope you did place the order....it's fantastic! Love the scarf. I'm looking for the perfect scarf for the Autumn, and this one looks perfect. i can see this being a versatile piece. it's so cool that it's a two tone print. Absolutely love it. If I one a gift card, I'd probably snag it too. I have a red leopard print scarf I got from Wet Seal two years ago. I love it! I'm not even much of a scarf person, but it's so good. I love scarves. I wear some every day. This is a gorgeous scarf. i like it. What a fun scarf! It embraces the leopard trend, but in a totally unique way. Love it! hi darling. thanks for stopping by. im a total scarf-addict.- and this scarf reminds me a bit of the lv scarf i want- the lilac one.. so nice.. but i cant really spent that much money on a scarf right now. i think i'd like it much better with a different outfit. the colors are gorg. That's actually a great scarf. And I love ShopBop.. but if I had a $100gc and was going to use it at ShopBop, I'd get me a new pair of JC's. ha ha ha. I'm kind of a shoe whore. AND maybe if we really need scarves in Hawaii, I'd go for the scarf. im a fan of leopard prints so im loving this scarf too! Oh what a gorgeous, gorgeous, beautiful scarf! I'm drooling! Well since you're using a gift card, why not? you're so lucky to win the giftcard! Totally love it. I'm a bit obsessed with leopard scarves myself these days (still saving). It is really cool. I like the idea. 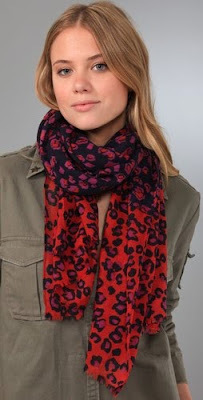 I've never seen a red leopard print scarf, very beautiful though!